I don’t live near a Prestat shop unfortunately, our nearest stockist is Selfridges in Birmingham, and they don’t sell the full range of goodies. This is a little frustrating as Spectre is totally hooked on their Matcha Green Tea Hot Chocolate, so I have to order it from their website. Obviously if I’m making an order anyway I can’t help but have a nosey what chocolates look new that I haven’t tried before. These Black Forest Gateau truffles stood out immediately, as the cake is one of my favourite desserts. 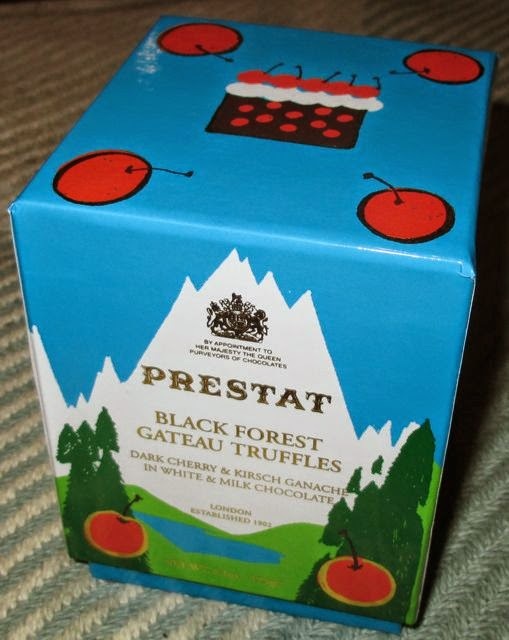 The box’s for Prestat’s chocolates are always very pretty, and this one is no exception as it is decorated with mountains and cherries. Inside the thick lush cardboard box the chocolates are wrapped in blue tissue paper, and then in plastic bad. The chocolate had a white chocolate coating and when I took the first bite I was expecting to find a whole cherry inside, I think because of the packaging. 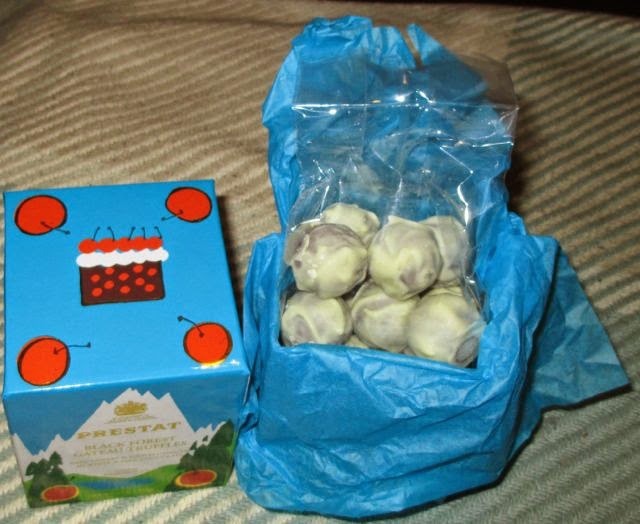 I didn’t of course, these chocolates are truffle based and contain a cherry kirsch ganache. The flavour is dark chocolate with a nice hit of cherry with an alcohol twist. I liked the way the flavours came together from the dessert, and the mix of chocolate and cherry never fails to satisfy. I’d have gone a bit more heavy on the cherry through, and I do have to say I quite fancy a whole cherry coated in chocolate! I also treated myself to a box of Prestat Red Velvet truffles, which I just can’t wait to crack open! 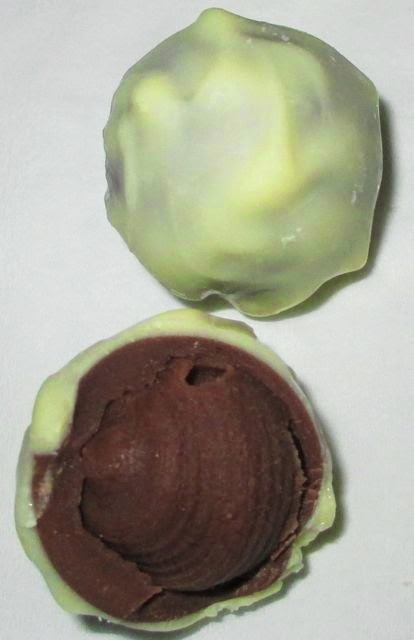 For a whole cherry in kirsch covered in dark chocolate, have you tried Ferrero Mon Cheri? It's easy to find on the continent, but a bit more elusive in the UK. Tasty though, not too sweet but great if you love cherries. Lisa - oh yes, you used to get them in a half and half box with Ferrero Roche - not seen them for ages!!! Ferrero mon cheri are lovely, get them on Amazon with free delivery on prime. Just had a look on Amazon - they have the Ferrero Golden Gallery too!!! That is a must buy for me!